This study determined the access, worth assessment and use of information by small-scale farmers in Oyo State. The study described socio-economic characteristics of small-scale cassava farmers; ascertained information access point preferences and analyzed information worth assessment. A multi stage sampling was used to select 360 respondents and data were collected through pre-tested and face validated questionnaire with a reliability coefficient of 0.88. The results show that majority of the cassava farmers (76.4%) had low access to information and 85.6% rated cassava innovation packages as of low worth. The most frequently used access point is oral communication (83%), which was also rated highest in motivation ability (77.7%), regularity (96.3%) and relevance of information (83.4%). Radio was rated as the most persistent (68.5%). social participation, farm size and use of hired labour had a statistically significant effect on access to information (p<0.01). 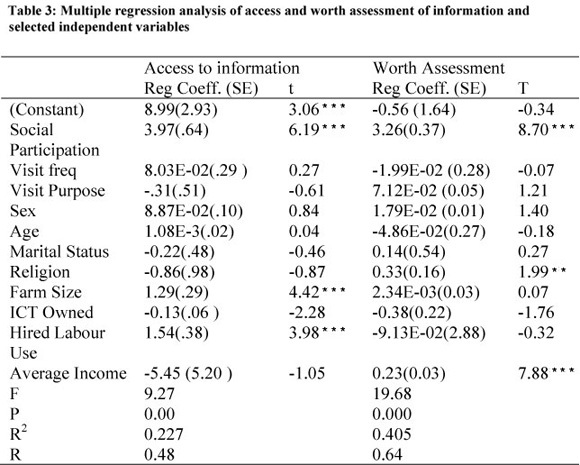 Religious participation, average income and social participation also had a statistically significant effect on information worth assessment (p<0.05). The study recommends that local farmers' groups identified as information providers should be recognized and used in complementing conventional extension efforts. This will improve access, worth assessment and consequently use of improved cassava information by small-scale cassava farmers in Oyo State. Key words: Worth assessment, Information, Information access points, Cassava, Farmers, Nigeria. Information dissemination is a critical tool for promoting national development, however small-scale farmers in many of the developing countries have limited access to agricultural information and this has been identified as one of the most serious constraint to agricultural development. The high output of agricultural research in recent times has led to a large pool of new agricultural technologies, which are disseminated through various communication access points such as Extension agents, radio, television, posters and meetings; with the assumption that the approaches enhance access by the small-scale farmers. The know-how and technologies that are produced by Agricultural Knowledge and information Systems/Rural Development Institutions (AKIS/RDs), even when relevant, are not widely taken up by farmers, suggesting a lack of effective transfer (FAO, 2000). The scenario in Oyo state, Nigeria shows that there is only 40% awareness of the industrial uses of cassava; 94%, 49% and 58% are aware of the use of cassava as livestock feed, pellets and pellets and chips respectively; another 20% is aware of the use of cassava in confectioneries (Philip, Taylor, Sanni, Okechukwu, Ezedinma, Akoroda, Lemchi, Ilona, Ogbe, Okoro, & Dixon, 2005b). Further, only 7 metric tonnes of cassava flour was exported yearly from 1996 to 1999 though the value increased to 2,300 metric tonnes in 2002 alone (Philip et al, 2005b). Obviously, there is a gap that could be filled by improving access to more information. There is the need to encourage the small-scale cassava farmers to access and possibly use more information as a means of increasing productivity. The information could range from market prices, new varieties/techniques or even available government services towards cassava production and utilization. Such information when at the disposal of the small-scale farmers may substantially influence the drive with which farmers execute their farming operations. Information consists of data that have been processed and are meaningful to a user. It is data that have been put into a meaningful and useful context and communicated to a recipient who uses it to make decisions (Babu, Singh and Sachdeva, 1996). Data on the other hand refers to raw unevaluated facts, figures, symbols, objects, events etc. Information involves the communication and reception of intelligence or knowledge. Information will help to appraise, notify, surprise and stimulate, reduce uncertainty, reveal additional alternatives or help eliminate irrelevant or poor ones and also influence individuals and stimulate them to action. According to Babu et al. (1996), the characteristics of good information are: relevance, timeliness, accuracy, cost-effectiveness, reliability, usability, and exhaustiveness and aggregation level. Information that leads to improved decision making is relevant. If it does not apply to your problem, it is not relevant. Important aspects of the concept are: the value of information and the place it occupies in decision making. Information supports decisions, decisions trigger actions and actions affect the achievements or performance of the system. The realistic value or revealed value of information is the measured difference in performance due to informational factors. To measure this value, we must be able to measure the differences in performance and trace the impact of information provided. The subjective value of information, on the other hand, is the reflection of people's comprehensive impression of information and the amount they are willing to pay for specific information. Information that does not meet the perceived need of the farmers is likely to be scored low on the worth continuum. However, when information meets the perceived needs of the farmers, their interest becomes raised and they assess the relevance of the information to their particular circumstance. Cassava farmers must integrate external information from many sources such as other farmers, specialist literature, scientists, technology transfer services, etc. with the knowledge of their circumstances. Thus, the rural poor have to be assisted to develop skills to access information sources. But before this can be done, a thorough understanding of the existing information management strategy is a prerequisite. Cassava which is a popular crop in the rural settings has been taken as the test crop. Cassava has contributed to the socio-economic development and well being of Nigeria both as a subsistence crop for households and as a commodity for domestic/ commercial operation/transactions (Kalu, 2006). The cassava initiative of the Nigerian government emphasized the potentials of the crop to become an industrial crop thereby elevating it from the low status position of poverty alleviation and food security crop to that of global economic significance and importance' (Kalu, 2006). The communication networks which exist in an agricultural system and the main actors that play a role in shaping agricultural and rural development have to be identified by understanding the links and sources of agricultural information and knowledge. There are robust empirical findings on Cassava varietal improvements, diseases and diseases control, improved implements, methods of cassava cultivation and processing (Philip, Taylor, Sanni and Akoroda, 2005a; Okechukwu, Ezedinma, Sanni, Dixon and Okoro, 2005) but there is dearth of empirical reports on cassava farmer's access to these information and farmers' worth assessment of the information with respect to the crop. Yet, in many countries low agricultural production has been attributed, among other things to poor linkages between Research-Advisory Service-Farmers and to ineffective technology delivery systems including poor information packaging, inadequate communication systems and poor methodologies (FAO, 2006). The objective of the study was to determine the access, worth assessment and use of information by small-scale farmers in Oyo State. Specifically, the study examined the socio-economic characteristics of small-scale cassava farmers; ascertained information access point preferences and analyzed information worth assessment. Oyo State was the chosen area of study because it is one of the highest cassava producing states and has been identified as one of the six states with potential for expanded production while concurrently exhibiting potential for processing cassava on a large scale (IITA, 2004). The state lies between latitude 7ºN and 9º 3'N and longitude 2ºE and 4ºE , it is bounded to the south by Ogun State, to the north by Kwara State; to the west by the republic of Benin and to the east by Osun State. The total area is about 27,249 sq km. Oyo State has two distinct climatic seasons, which are dry season commencing from November to March and the rain season from April to October. This trend has altered slightly with erratic nature of rainfall in recent times. The average annual rainfall is estimated at between 1,194mm in the North and 1,278mm in the south. The population of the study is the small-scale cassava farmers in derived savannah and forest eco-ecological areas. The state was divided by the Oyo State Agricultural Development Project (ADP) into 4 zones, 28 blocks and 224 cells. A multistage sampling technique was used to select respondents. From 28 blocks 8 were selected; which was followed by the selection of 24 cells. One village was selected from each cell and 15 respondents were selected from each village making a total of 360 respondents. Data were collected through the use of structured questionnaire that was pretested and subjected to face validity and has a reliability coefficient of 0.88 from the test-retest method. The questionnaire consisted of sections on personal characteristics and information and access point worth assessment. Information Worth Assessment was measured using Timeliness ( scored as follows Very timely=3; Timely=2; Not Timely=1); Adequacy (Not adequate=1; Adequate=2; Very Adequate=3); Relevance (Very Relevant (3); Relevant (2); Not Relevant (1)) and Accuracy (Very accurate= 3; Accurate=2; Not accurate=1). Worth Assessment of Access points was measured using Motivation ability (High motivation=3; Average motivation=2; Low motivation=1); Regularity of new technologies (Very Regular=3; Regular=2; Not Regular=1); Relevance of new technologies (Very Relevant=3; Relevant=2; Not Relevant=1) and Persistence of the access points (10years or more=3; 5-9 years=2; 1-4 years=1). Data were analysed with SPSS version 17 using frequency counts and percentages to describe the demographic characteristics while multiple regression analysis was used to isolate the determinants of access and worth assessment of information. 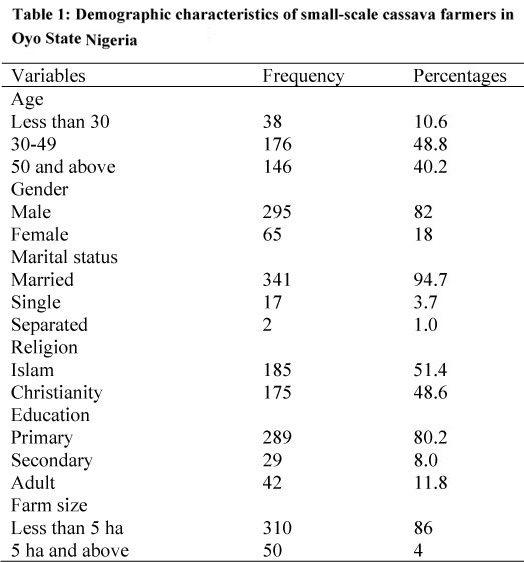 Table 1 shows that most of the respondents (48.8%) were middle aged (30-49 years) while respondents of 50 years old and above accounted for 40.2%. The mean age of the respondents was 45.66 years. This is similar to the findings of Yomi-Alfred (2000) who found that 15% and 42.5% of rural people in Yagba East in Kogi state were in age bracket 30years or less and 30-49 years old respectively. Eighty two percent (82%) of the respondents were male while 94.7% were married. This is common in most rural areas in Nigeria, because agriculture in the rural areas is labour intensive. Farmers, though young may therefore be married in order to increase farm labour (Ladele and Omotesho, 2000). Marital status has been identified (Olaniyi, Adesiyan and Ayoade (2008) as one of the factors that affect adoption of new technologies. About eighty percent (80.2%) of the respondents had at least primary education and cultivate less than 5 hectares. This is similar to the findings of Farinde and Soetan (1999). Further, most of the respondents had radio (82.7%), while a lower proportion had Television (49.7%) and Mobile telephone sets (31.9%) which can serve as a source of information access. Also 93% of the respondents belonged to at least one social group which facilitated the spread of information. The findings of Akoroda and Ikpi (2004) showed that the distribution of cassava information spread is almost confined to within the villages, such that the spread from one village to the other also depended on the presence and frequency of contacts which may be familial, commercial, or socio-cultural (agricultural shows, communal ceremonies). 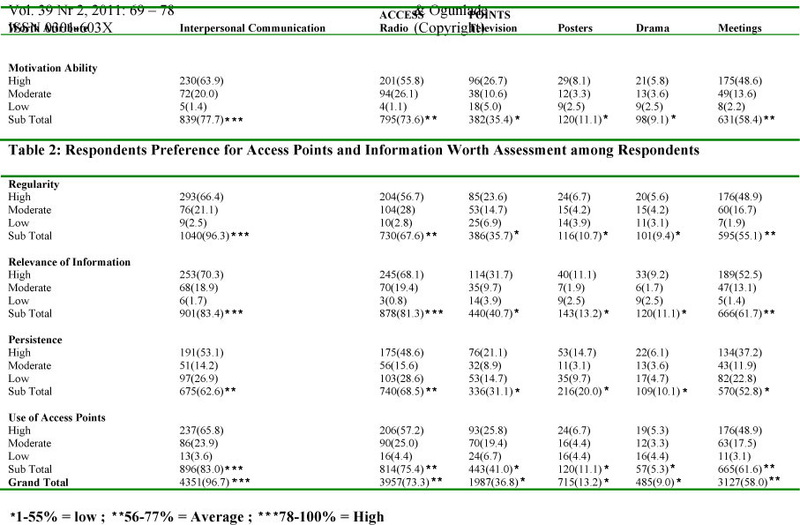 Table 2 shows information worth assessment of the various information access points. Interpersonal communication was consistently rated highest in four of the worth assessment criteria: motivation ability (77.7%), regularity (96.3%), Relevance of information (83.4%) and use (96.7%). This is in line with the argument of Merril-Sands and Kaimowitz (1990) who noted that small agricultural systems can make greater use of personal relationships in information sharing and they rely on personal relationships rather than on more formal linkage mechanisms. Radio was rated as the most persistent (68.5%), compared to 62.6% for interpersonal communication. This implies that radio might have been more consistent in the provision of Cassava innovation over the years than other access points. This is in agreement with the study of Adekunle et al (2004b) in Kano where Radio was found to be the preferred medium for receiving agricultural information across the age groups. According to the study, 'all the farmers have access to radio... listening to radio is a usual pass time activity among the farmers. Further, meetings were of higher worth than television, poster and drama. The overall relative worth of the access points is in the order: Interpersonal Communication (96.7%) > Radio (73.3%) > Meetings (58.0%) > Television (36.8%) > Posters (13.2%) > drama (9.0%). This study however shows that when all the performance indices are pooled together, interpersonal communication may have been more useful than radio in providing access to agricultural information in this particular study area. The results of the estimates of the regression parameters are presented in Table 3 which indicates that social participation, farm size and use of hired labour have a statistically significant effect on access to information in a manner consistent with a priori expectations. High social participation may have led to increased communication network while large farm sizes and use of hired labour are closely correlated thereby creating more time for meetings and/or higher media viewership. Although the variables could only explain 23% of the change in access to information, it is nevertheless statistically significant. Most of the change (13%) was explained by social participation and farm size (6%).The table also shows that religious participation; average income and social participation had a statistically significant effect on information worth assessment. Religious and social participation as well as ability to pay for innovations may have had substantial effect on respondents' judgments of information worth. The regression variables could explain 41% of the change in information worth assessment. Thirty-six percent of the change was explained by social participation (26%) and average income (10%). The study has clearly shown that access to cassava information was low among small-scale cassava farmers and was significantly influenced by social participation, and farm size. And that information from friends and neighbours were of higher worth to the farmers than other information providers. Significant determinants of access and worth assessment of information were social participation, farm size and use of hired labour. It is therefore recommended that local farmer groups identified as information providers should be recognized and used in complementing conventional extension efforts. This will improve access, worth assessment and consequently use of improved cassava information by small-scale cassava farmers in Oyo State.